I first tried this recipe from Kylie Kwong's cookbook, My China and have made this dish a few times since then. I love this version. At first I was rather surprised to see this rather light version, from the photo in the book, as the Kung Po Chicken that I am familiar with is coated with dark thick sauce. 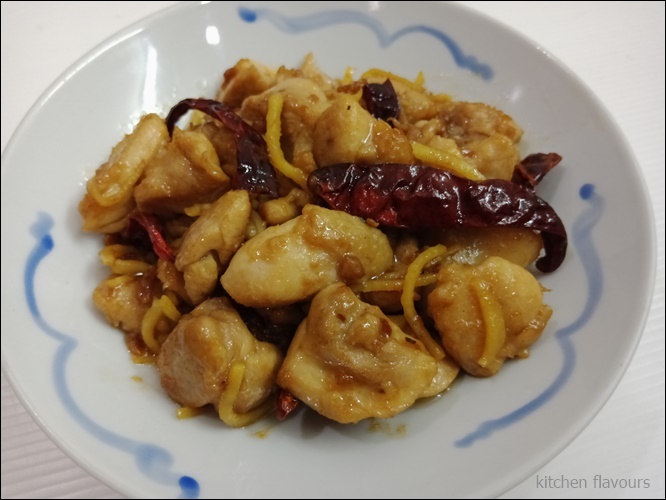 When eating out at Chinese restaurants, Kung Po Chicken would be one of the frequently ordered dish, cooked with the signature ingredient, dried chillies, and usually with cashew nuts or peanuts. According to the author, "Although I have eaten several versions of Kung Po Chicken in Chinese restaurants around the world, none of them prepared me for this lip-smacking authentic version". I have made this dish with both chicken breast fillets and chicken thigh fillets, both are delicious, but we prefer the thigh fillet. I have omitted the peanuts as we do not care for peanuts in the dish. This dish has no sauce, but it is moist and delicious. Good with white fluffy rice, served alongside some stir-fry greens and a bowl of herbal soup. It has now secured a place in my list of "everyday dishes"! Combine chicken with cornflour and Shao Hsing wine in a bowl. Cover, place in refrigerator and leave to marinate for 1 hour. Place oil and chillies in a cold wok and then turn heat to low. Cook for about 1-1/2 minutes or until chillies begin to darken slightly. Using a slotted spoon, immediately remove chillies and drain on kitchen paper. Leaving chilli-infused oil in wok, turn heat up to high and stir-fry half the chicken cubes for 3 minutes. Remove with a slotted spoon. Add extra oil to wok with remaining chicken and stir-fry for 3 minutes. Return all chicken to wok, along with ginger and reserved chillies and stir-fry for 30 seconds. Add sugar and stir-fry for 30 seconds. Add peanuts, soy sauce and vinegar and stir-fry for 30 seconds. Serve immediately, sprinkled with Sichuan pepper and salt. This is another tasty recipe from Rachel Allen. 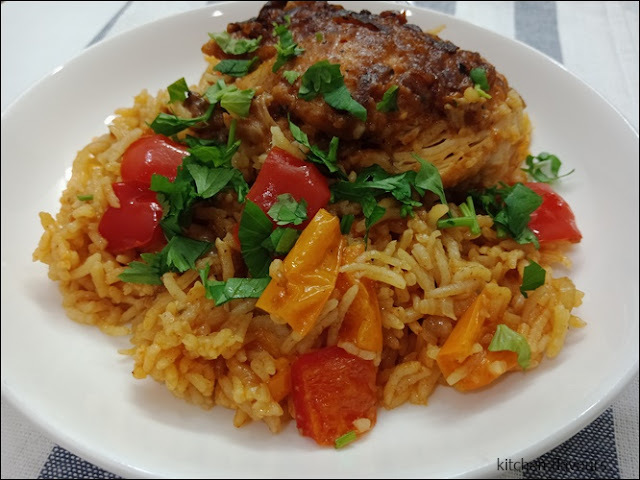 Chicken, peppers and rice cooked in one pot, with the touch of Spanish, from the smoked paprika and peppers. I love one pot meals such as this, especially when there's rice cooked together with all the other ingredients. In a large bowl, mix together the flour, paprika, black pepper and salt. Add the chicken thighs and toss in the mixture until well coated. Place a large saucepan or casserole dish on a medium-high heat and pour in 50ml of the olive oil. Add the chicken pieces and cook for 3-4 minutes on each side or until crisp and deep golden brown. Remove from the pot and set aside. Pour the remaining oil into the same pan or dish and add the onion and garlic. Saute, stirring occasionally, for 5 minutes or until almost softened and a little golden around the edges, then add the peppers and cook for a further 5 minutes. Add the mixed stock and tomato puree and the rice, stirring to mix. Return the chicken to the pot, cover with a lid and simmer gently for 20 minutes or until the chicken is completely cooked (the flesh white all the way through). If using prawns, add them just before the end of cooking time - 5 minutes for raw prawns or 2 minutes for cooked prawns. Scatter with the chopped parsley and serve with a slice of lemon if you like. Made this easy and delightful cool dessert to be enjoyed as an after dinner treat. Dried apricots are chopped and simmered in a small saucepan with a generous amount of orange juice and a little honey, until the apricots are soft and plump. Remove from heat and allow to cool. 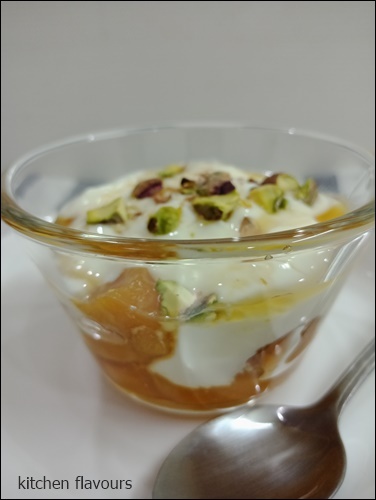 To serve, spoon some of the apricots and the juices into a glass cup or bowl, spoon over some Greek yoghurt, then drizzle with some runny honey, I've used orange blossom honey, and scatter chopped pistachios over. A healthy light dessert, can also be made for breakfast. Instead of yoghurt, you can replace with ice cream, which would make a divine treat! Place the apricots in a small saucepan with the orange juice and 2 teaspoons of the honey. Simmer for about 10 minutes or until soft and plump, then remove from the heat and allow to cool. Divide the fruit and its juices between the glasses, then add the yoghurt, spooning it over the top of the fruit before drizzling each serving with 1 teaspoon of honey and scattering over the chopped pistachios. 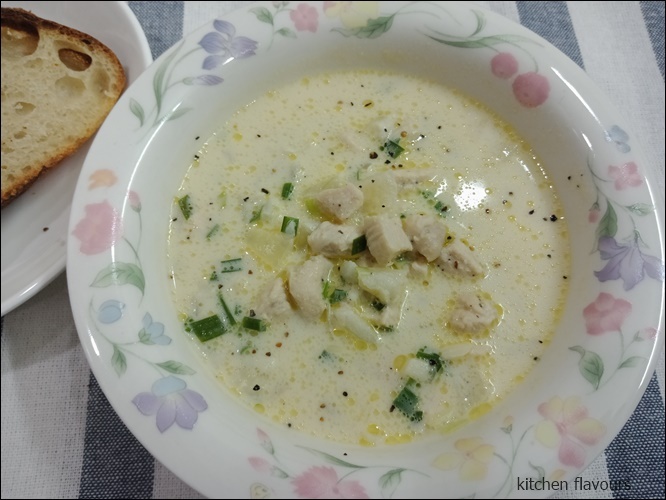 A quick and easy garlicky chicken soup. We had the soup with my homemade sourdough bread for a simple weeknight dinner. Pour in the stock, the milk and cream and bring to the boil. Stir in the chives and spring onions and simmer for about 5 minutes or until the spring onions have softened. Check the seasoning, adjusting it if necessary, and ladle into warm bowls to serve. This is a delicious pasta dish. I like it that the pasta, fusili, is simmered in the sauce until tender, instead of boiling it in salted water. 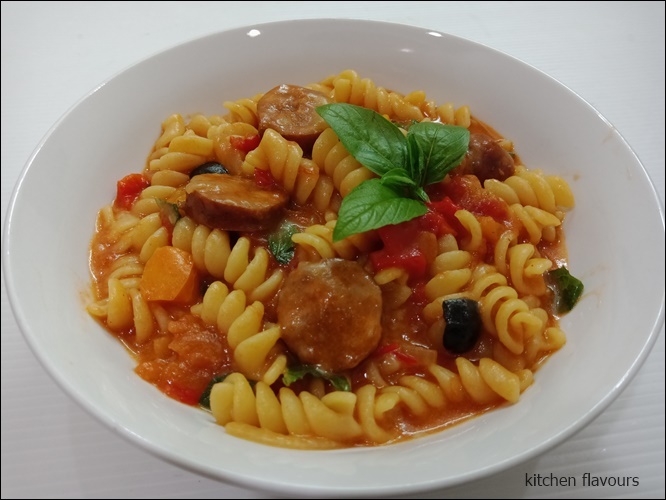 A fuss free pasta meal, where the cooking is done in one pot only. A one pot meal with flavours of the Mediterranean. Sliced onions and garlic are sauteed in oil until the onions are soft and a little caramelized. Add the sliced peppers, chorizo and cook for a couple of minutes. I have added half a teaspoon of smoked paprika. Pour the can of chopped tomatoes, stock, sugar, pasta and salt. Bring to a boil then reduce heat to low, cover with a lid and cook for about 10 -12 minutes until the pasta is just tender. Remove from heat, stir in the mozzarella, olives and basil leaves, season with some black pepper. Serve immediately. We love this pasta dish. One that I will cook again. I may omit the mozzarella, for a less creamy taste but full tomato flavour. Place the butter and olive oil in a large saucepan on a medium heat. When the butter has melted and starts to foam, add the onion and garlic and cook for 10-15 minutes, stirring regularly, until the onion is soft and a little caramelised. Add the sliced pepper and chorizo and cook for a further 3 minutes, (I added the smoked paprika together with the chorizo), then pour in the tomatoes and all their juice, along with the stock, sugar, pasta and 1/2 teaspoon of salt. Bring to the boil, then reduce the heat to low, cover with a lid and cook for 10-12 minutes or until the pasta is just tender. Remove from the heat, stir in the mozzarella, olives and basil, add a grinding of black pepper and then divide between bowls to serve.